Blame the punishing economics of running a kosher meat emporium in 2018, not the redesign of Queens Boulevard that's saving lives. Jay Parker, the owner of Ben’s Best in Rego Park, is going out of business, the latest casualty in the long attrition of Jewish delis that’s claimed institutions as popular and venerated as the Carnegie Deli. I learned to salivate at the sight of chopped liver at a young age, and I would love to head over, pay my respects, and wolf down some hot pastrami and pickles before Ben’s Best is gone for good. But it’s hard to muster much sympathy for Parker when he tells anyone who’ll listen that he can’t stay solvent because of the Queens Boulevard bike lane. The line Parker has been peddling is that Ben’s Best wasn’t done in by the punishing margins, skyrocketing beef prices, and shrinking market for kosher meat that have wiped out so many other Jewish delis. Nope, it was the bike lane’s fault. As wild as that explanation may seem, reporters are eating it up like kreplach. WPIX ran a whole “bike lanes killed my deli” segment. A Daily News piece where Parker blamed the bike lane was approvingly quoted on Twitter by Council Member Chaim Deutsch, whose Brooklyn district is nowhere near Queens Boulevard. 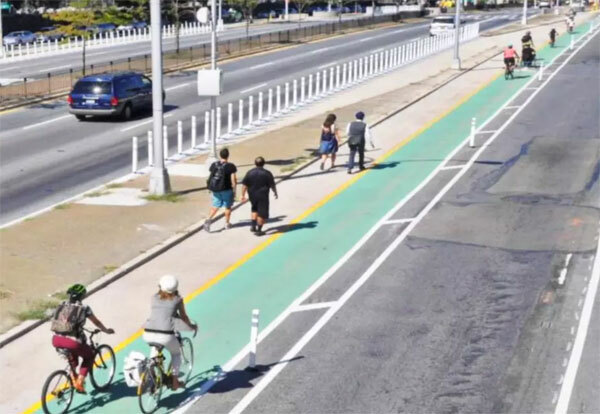 New York needs a lot more of these projects to make cycling safe enough for most people to give it a shot, and it’s a myth that the local retail economy will suffer in the process. Earlier research has proven that in general, bike lanes and other projects to make NYC streets less car-centric aren’t harming storefront businesses. And in the specific case of Ben’s Best, the argument that poor customer access was a decisive factor in its demise doesn’t hold up. The deli sits right on top of a subway station served by three lines, near a confluence of local bus routes. Crammed within a few blocks are a dozen parking structures containing giga-feet of car storage, including garages at the Rego Center Mall where you can buy three hours of parking for a measly $3 (cheaper than a side of health salad at Ben’s Best). Ben’s Best launched in 1945, but the parking spaces that the bike lane replaced only date back to 2001, when DOT added a parking lane to slow down drivers who were killing people by the dozen on Queens Boulevard. Street changes don’t explain its declining business — the challenging economics of running a kosher deli in 2018 do. In a sign that Parker was cutting corners before the bike lane appeared, Ben’s Best, like the Carnegie Deli before it, was sued by workers for wage theft in 2015. The segment of Queens Boulevard near the deli wasn’t redesigned until mid-2017. Parker could have gone out with class, without taking a swipe at a project that’s saved lives. Instead, he chose to blame the bike lane. Hope the new owner gets the city to put in some bike racks, and makes a mint out of his new customers. You forgot to mention landlords with stars in their eyes trying to get more rent than the market will support, a problem all over the city. Eventually, after getting no rent for a long period, they’ll have to deal. Was this guy’s lease up? He says the rent wasn’t getting jacked up.
? The real issue is all those durned vegans. They only bike because they’re treehuggers. Insidious! Weird that selling $20 sandwiches to elderly Jewish customers who long ago moved to Long Island and now visit once or twice a year isn’t a viable business model in a neighborhood that’s undergone striking demographic change over the past few decades. so you didn’t “forget” something that wasn’t true? It’s astonishing. As an NYC cyclist, Jew, and mostly-vegetarian dude who will make exceptions for excellent deli, casting aspersions like this on the bike lane is a shanda! A shanda, I say. But I’m distressed to see this blog dumping on Jay Parker, who has no reason to defame the bike lane if the loss of handy parking isn’t in fact hurting his business. Your citing of the theoretical availability of parking in nearby garages completely misses the point of real-life customer behavior. That deli hasn’t survived since 1945 by not understanding its customers. Instead of libeling Mr. Parker, those who are benefitting from the bike lane should now pitch in to pressure the City to assist the deli and other affected businesses find new locations where they can once again prosper. Bike lanes are great, but a local institution like Ben’s Best is a unique amenity that can’t be replaced. The problem is not this blog ‘dumping’ on Ben’s nor Jay’s willingness to list a bike lane as the only reason his otherwise strong business has been ruined (C’mon…) to anyone who will listen, but the press’s willingness to simply print this take nearly as an advertorial without any second thought. ‘Parking’ is the way failing businesses justify their failure without having to blame themselves, their customers both actual and potential or their business model. It would help if the rest of the media took a bit more critical look whenever this is thrown out there. For that, thanks Streetsblog! Oh, and ‘libel’? I think you may have meant something else. This Jay Parker is some piece of work. He’s involved in a labor dispute where he denied wages, going out of business is a good way not to pay a settlement, Dept of Health cites Ben’s for many violations including rats, his customers moved away or died, he doesn’t market to get new ones, there’s a parking lot across the street and he blames…bike lanes! I’ll preface this by saying if any business requires curbside parking in order to be successful then that business doesn’t have a viable business model. If the majority of your customers come by car, then it’s up to the business owner to provide parking for them on their own property. That typically means making a parking lot. If real estate is too expensive for that, then you just don’t have a viable business. Also, the city should probably actively discourage any business where most of the customers come by car because overall the taxes these businesses might pay are offset by the damage the city pays for due to their car-driving customers. It’s a net loss for the city. The problem with your idea of NYC helping businesses relocate is that it sets an awful precedent. So NYC should help Ben’s Best because it’s a “local institution”? What about the many other businesses which have gone under, and may well have been more useful to the communities they served while they existed than Ben’s? The city can’t be in the business of picking and choosing which businesses survive. Nor should it try to preserve businesses which aren’t viable. If the city wants to help businesses, there are three things it can do. Cut taxes, cut unnecessary regulations, and foster an environment where rents and real estate are affordable. NYC is failing at all three. That’s why so many mom-and-pop businesses have been replaced by chains. High rents are why some blocks have nothing but banks and expensive boutique stores which only the wealthy can afford to frequent. Long term this model isn’t sustainable. Eventually the banks and chain stores will dump any branches where high rent eats up most of the profits. The city needs affordable commercial as well as residential real estate. Trying to help businesses which are closing because of high rents, high taxes, and over regulation is a bandaid at best. I’ve said it before but any business which depends upon curbside parking to survive just doesn’t have a viable business model. NYC shouldn’t be providing free or below market parking for businesses. The bike lanes are part of the reason Ben’s Best is going under, sooner rather than later. Many of Jay’s customers are elderly people are/were accustomed to being able to drive up to the restaurant, park, dine, and then drive off after their meal. The elderly do not want to park in a lot a few hundred feet away, and then have to pay to park in a lot where they may need to wait for an attendant to retrieve the car. The Jewish-American demographic in Queens has been shrinking for years. The elderly are dying off; younger Jewish-Americans have moved on to other points. Also, the younger generations as a whole are seeking out other cuisine choices that are billed as more healthful/romantic/cheaper/trendier then kosher deli food. As for the Bukharian Jews in Rego Park, they tend to dine in establishments catering to their own community. In short, if the bike lanes didn’t cause Ben’s Best to lose business sooner, the loss of aging customers dying off, changing demographics and tastes would have ultimately affected Jay’s business. ”Schwartz became Smith, Liebowitz became Lieb”. What is it that became Parker? I generally agree but I’d say at best the bike lanes are playing a very small part in all this. The other factors you mention are much more relevant. Remember he wasn’t paying his employees because business was bad long before the bike lanes went in. The veg lobby is an all-powerful enterprise. And like a lot of older restaurant owners, he probably isn’t too keen on change. We’re going to be hearing the same thing when Barney Greengrass finally bites the turf – be prepared. the bike lane is a complete joke, an out-of-touch Civic board’s idea of a great pipe dream. the rule with these boards is that if it ain’t broke, better fix it to justify our existence. Queens Boulevard is no safer than it was when it was a full 12 Lane thoroughfare, misleading press and absurdly bad statistics turns a bad year or two and a bunch of folks who couldn’t tell red from green into “it must be the boulevard of death.” and this nonsense with in the bike lane is just another way to Hipsterize the city, at the expense of residents. nobody uses it!! Feel free to go sit there and watch. people aren’t moving en masse to Kew Gardens and then biking their way through Elmhurst and Woodside to the city. It just isn’t happening. people take the subway. just another dumb idea to justify the existence of a bunch of farts who needs to be involved in local Civics to feel like their lives are worthwhile, but a really bad idea from the start that has completely failed, as it is simply is not used. And if it ever does get used, believe me, we’re going to see fatalities go way up. Exactly what has happened in Manhattan, with all the bike Lanes their bikers are getting killed and injured left and right because bikes do not belong in Manhattan alongside cars. I think you meant to make a left in Albuquerque, bud. You completely miss the point that there was no street parking for 56 years, from 1945-2001, and they survived just fine for that time. I hesitate to even debate this, since the closing has nothing to with the bike lanes (except in Parker’s imagination) but just for the sake of argument: You know what else can’t be replaced, that’s more important than a neighborhood institution? The 200+ pedestrians who’ve died. Please, do tell their relatives that Ben’s chopped liver is more important than the livers of their loved ones splattered across Queens Blvd. After bike lanes: Zero fatalities. Queens Boulevard has been completely transformed. The difference between the former stressful ride and the current easy ride is enormous. I typically lavish high praise on Bloomberg and Sadik-Khan; while for de Blasio I give a total dismissal, what we call in Esperanto a “prifajfado”. (I cannot really have any opinion on Trottenberg, as she can do only what de Blasio authorises her to do.) But QB is one case where de Blasio and Trottenberg deserve thanks. The problem was not, as you said, “running a kosher deli in 2018”. There’s a strong demand for kosher restaurants especially since over the years the demographics in Queens have become more Orthodox. The problem is that it’s not in fact kosher by Orthodox Jewish standards. They would do a lot better if they had a proper kosher supervision. Those pedestrian deaths were tragic, obviously, but the bike lanes have little or nothing to do with ameliorating the flaws in street design that were responsible. As for the parking situation in the earlier period you cite, you overlook the fact that back then the local demographics were more favorable to the restaurant. They had more local, pedestrian customers then, a group that shrank through the years of that era. I spoke to Parker and to some of his employees. He and they were able to cite specific statistics about the falloff in their business once the parking was lost. These folks were keenly aware of things like how many fewer rye breads they were going through each day. The impact was obvious. I can see no purpose to their being dishonest about that and I’m baffled that you do. As I said to you before, Parker could have closed at any time without ever having to justify his decision to anyone. I don’t see why you think he would lie to do so now. Anyway, the joint is gone and the bike lanes remain. I wish you safe and happy cycling, on Queens Boulevard and everywhere else. To elaborate on this point, the fastest growing segment of the Jewish community is Orthodox. Whose hallmark religious observance is not doing business on the Sabbath (Saturday in Judaism). “Do they observe the Sabbath?” is equivalent to “Are they one of us? Can they be trusted?” Orthodox Jews will not eat meat from a place that is not rabbinically certified as kosher. And a place that sells meat products and is open on the Sabbath does not get certified kosher by an Orthodox rabbi. This reminds me of a diner in my neighborhood that claimed that they were closing due to NYC’s then-new smoking law. Until it became known that the entire block was being torn down and redeveloped. Yes, all the bars in NYC thought they were going to shut down because of the smoking ban. Now normal people can go to bars because they don’t have to worry that their business suit will smell like smoke. The bar business has been booming ever since. As a customer who cam from bayside to eat at bens best, I can tell you the bike lanes did him in. Once put in, I would decide not to go, because of trouble finding a spot. The author is just trying to cover up, the truth. Therefore the cause of the place closing is people like you, who opted not to go there by bike, bus, or taxi. It’s sad to hear that the business was doing so badly that it was ruined by losing one customer! Funny how all of a sudden the leftists on reddit don’t care about the small business owner. As always, drivers have met the enemy — and it is anyone but them! More road rage — and violent tweets — from a state senator.